I had no idea that Tchaikovsky could take me to the places I went to tonight under the stars at the Saratoga Performing Arts Center (SPAC) with the Philadelphia Orchestra! The venue is a beautiful, open-air amphitheater that also happens to be where my mother spent a 34-year career. It wasn’t the first time I went there since she died two and a half months ago. However, it was, by far, the most emotionally powerful! My daughter, husband, and his brother’s family of three visiting from Colorado sat on the sloped lawn with me. I was in a reverent mood and expected a level of decorum around me that honored my mom’s spirit and life work. How wonderful it was to be there as the sun set behind the amphitheater, following a sun shower that painted a rainbow across the sky (pictured, below, over the building in which my mom worked). The first half of the program included Joaquin Rodrigo’s Concierto de Aranjuez for guitar and orchestra, featuring Montenegrin guitarist, Milos Karadaglic. During the piece, the sky was dark, and crickets chirped in the distance. It occurred to me that my mom would have loved the performance because she was so passionate about guitar. It also occurred to me that, although my mom’s spirit is always in the air at SPAC, if any evening could pull her away from the formless realm back to SPAC, it would be tonight – for my dad, my sister (who isn’t “into” orchestra), my daughter, and I all were there. That was a first! The only one missing was our middle sibling who lives out of the area. During a guitar solo, my daughter and I started sniffling at the same time, for we both realized the significance of us all being there on this particular evening. During intermission, my daughter and I went down to the amphitheater to find my dad and sister and talked with them and a couple of my mom’s friends until intermission was over. We stood in the same spot in which I dreamed of my mother smiling and walking by as I spoke with a few people during the first dream I had of her following her death. It just so happened that’s where we ran into one another. After intermission, the orchestra performed Tchaikovsky’s Symphony No. 6 in B minor, op. 74, Pathetique – the composer’s final, completed symphony. It was composed in 1893, the year he died, and premiered nine days before his death in October. I was getting a little tired but appreciated my surroundings with all my senses. I imagined my mom sitting inside with my dad in their special seats, dressed impeccably. As the symphony played, I closed my eyes and allowed the music to conjure images in my mind – of a ballroom filled with women in gowns and men in suits, dancing, in pursuit of love. I was so glad to be at SPAC and reflected on why I had rejected so many of my mother’s invitations to attend classical performances in recent years. The first time I attended a performance this summer with one of her former coworkers, I ran into my dad, who couldn’t believe I was there because I “hate ballet.” Well, that was never the case, but apparently it was the impression I gave. I think expressing disinterest toward the ballet and orchestra was just another way to push back against my mom and cultivate a separate identity. Sometimes, when something means so much to a person, it becomes more about the relationship than whether or not you actually enjoy the event to which you’ve been invited. Now that she’s gone, that boundary no longer exists. I can go to the orchestra and enjoy it! I wished my mom could know that. I continued to savor listening to live orchestra in a setting infused with my mom’s spirit. 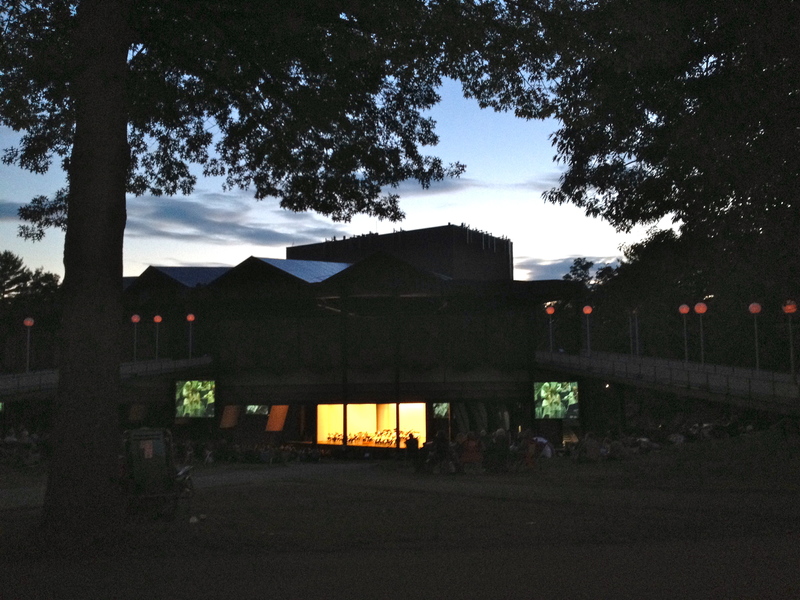 During the unconventional Adagio lamentoso finale, I opened my eyes and let images of the SPAC grounds at night and all the summers I spent there flood my heart and mind. And then I became aware of another presence. My own spirit was there, too: The little girl given the special honor of accompanying her parents to the ballet or orchestra rather than staying home with the babysitter. The young pianist who dreamed of someday being a soloist with the orchestra. The elementary school student with the biggest crush on her music teachers – one of whom worked at SPAC during the summer. (How thrilling it was to see her and other teacher friends who were ushers and gate attendants!) The adolescent who anticipated the thrill of meeting the performers backstage after the show. Back then, SPAC was my summer universe, and there were so many people there who were so familiar and influential in my life – people brought together by a mutual appreciation of the arts. It was like a SPAC-based life review that also included a memory of bringing my young children to an orchestra performance that ended with Tchaikovsky’s 1812 Overture (complete with cannons). When the walkway lights were turned up at the beginning of intermission, my son (who was about five years old at the time), stood up and started walking up the walkway, exclaiming with delight, “I loved it!” – an unforgettable response to his first orchestra experience. All of a sudden, I was with all of the old, familiar faces again, along with my mom and the ghost of my many, younger selves. I felt deeply grateful for all the time I spent at SPAC growing up. The symphony’s slow, mournful finale brought out all these memories and feelings as if by some kind of musical magic. I began weeping silently but uncontrollably. I’ve never cried like that in a public place, but I suppose it was bound to happen sometime at SPAC, and why not below the trees and stars, with crickets accompanying Tchaikovsky and so many people who loved my mom in the audience? It was a safe place to cry – spacious and fortunately quite dark! But the tears were not of sadness. Not at all! They were of the most profound gratitude. I sent out a sincere prayer – Thank you, Mom – to greet her wherever she is, and hoped my deep gratitude would bless her soul. After we all went our separate ways, the tears continued to flow all the way home as an impossibly huge, 3/4 waning gibbous moon floated into the sky up ahead. Postscript: I didn’t read the program notes until a full 24 hours after the concert, after I finished writing this piece. I found it interesting that Tchaikovsky wrote that he “wept profusely” as he composed the symphony in his mind!